The 20-year-old singer is set to undergo the operation to remove the tissue from her throat later this year in the midst of promoting her new album 'Demi' and ahead of the next series of 'The X Factor' USA and she admits her hectic schedule and surgery could stop her from touring. 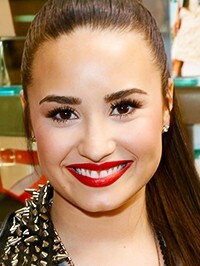 Speaking in a 'Live From MTV' interview, Demi said: "Actually, this summer I have to get my tonsils out ... I'm not sure if this year is the best opportunity to [tour] because 'X Factor' keeps me so busy." In a bid to be brave, Demi aims to go under the knife without any anaesthetic, but isn't sure whether her plan will pan out as she hopes. She quipped: "I'm gonna do it without painkillers, though, 'cause I'm a boss. I say that now!" Despite putting on a tough exterior for her upcoming surgery, Demi admitted it was an entirely different case while recording her new record and even found herself "sobbing" while recording ballad 'Shouldn't Come Back' as it was so emotionally liberating to pour her heart out through lyrics. She recalled: "I was just sobbing because it was just built-up emotion that I was finally getting to release in music. And there was a turning point in the song originally about one thing and then ... I was like, 'I want to try something new,' and I kind of... freestyled the lyrics. "And I just changed the song completely, and my producers in the studio were like, 'Whoa, it just got heavy.' "
Demi - who entered rehab in 2010 to be treated for an eating disorder, self-harming and bipolar disorder - is anxious about how she will perform emotional songs such as 'Shouldn't Come Back' and 'Warrior' live. She added: "With those songs, I don't know if I will perform them on stage. To be in front of an audience and be that vulnerable, I don't know if I can do it ... But I may have to and I may have to get over it and realise that I let the world in on this certain topic and here we go."